Click , and select to add a Queue Summary widget from the drop-down menu. In the widget that opens on the right, enter the name of the widget. To select the desired metrics, click next to Metrics, and then click Configure to select from the available list of metrics, or search to find and add specific metrics. Select the queues you supervise. Click next to Queues, and click Configure to select from the drop-down list of queues, or search the list to add specific queues quickly (John selects Tiers 1, 2, and 3). 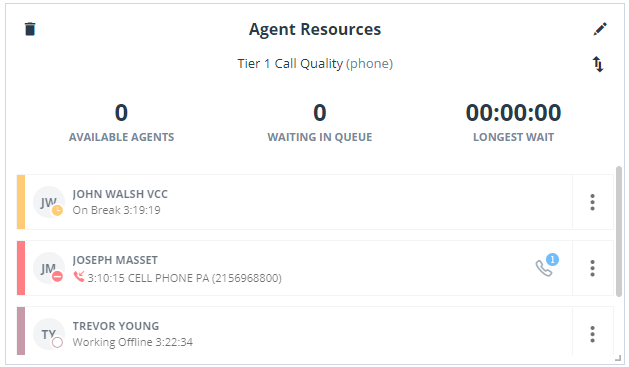 To add an agent performance widget, you must select a queue, select the agent performance metrics, such as the number of calls, accepted, rejected, handled, average handling time, and more for every selected agent. These metrics reflect data for the last 15 mins, 30 mins, or for the day so far. You can also access real-time metrics about the current status of the agent, the status on lines 1 and 2, and the duration of the login. Click , and select to add a Agent Performance widget from the drop-down menu. The option to Sync agents automatically is enabled by default, and selects all agents supervised by you. Disable this setting to manually select the desired agents from the list, or filter by keywords. To select the desired metrics, click next to Metrics and then click Configure to select from the available list of metrics, or search to find and add specific metrics. Select the agents you need the data for. Click next to Agents, and then click Configure to select from the drop-down list of queues or search the list to add specific queues quickly (John selects Tiers 1, 2, and 3). The data table appears on the left side of the panel. Click , and select to add a Agent Status widget from the drop-down menu. Enable dynamic filtering. Dynamic filtering reflects metrics for any selected queue in the Queue Summary within the dashboard. If dynamic filtering is not selected, it shows the agent performance metrics only for the selected queue. For example, John must ensure agents availability in the Tier 1 queue, which handles interactions from their premium customers. To keep an eye on the data at all times, John chooses the Static type. Slide the toggle Enable legend to show/hide the information indicators in the pie chart. Click Save to save the agent status widget. The data pie chart appears on the left side of the panel. John creates a second agent status widget and chooses the Tier 2 queue, but selects dynamic data type. This widget helps him watch the status of agents in Tiers 2 and 3 by simply selecting the desired queue in the Queue Summary widget. The agent resources widget simply lets you access real-time data about an agent’s status. Is Emily in Tier 1 on a call, or available to take a call? If she is on a call, how long has she been on the call? who is she on the call with? This widget answers all these questions in real time. The status of each agent in the selected queue is indicated by the color used in the agent status pie chart. Click , and select to add an Agent Resources widget from the drop-down menu. Enable dynamic filtering. Dynamic filtering reflects metrics for any selected queue in the Queue Summary within the dashboard. If dynamic filtering is not selected, it shows the agent performance metrics only for the selected queue. For example, John must ensure that agents use their time efficiently. He watches how long an agent is on break, checks if he has exceeded the allowed break time, and pings an agent to make themselves available soon if the count of available agents goes too low. Get improved visibility of critical KPIs on the data-rich dashboard using single stat widgets. Create a single metric widget for any queue or agent performance metric. For queues: Select from any of the available queue performance metrics, and create a single stat queue widget. For agents: Select from any of the available agent performance metrics, and create a single stat widget. Go to Dashboards, and select an existing dashboard. In the Add Widget box, add a name, and select the desired queue and a metric. Enable the dynamic filtering toggle to apply the metric dynamically for a desired queue or agent. Position the newly created widget on your dashboard as desired, and save your dashboard. A threshold allows you to define a limit for a metric, which alerts supervisors when exceeded, seeking their attention. Threshold alerts can warn you to watch metrics closely and necessitate action. You can create and apply thresholds to queues, and get visual and audio alerts when the thresholds are met. If you create a threshold for longest wait time in a queue, assign it to a queue, and create a single stat widget for this metric, you can watch the threshold visual alerts on the single stat metric. Learn how to create and assign thresholds and get instant alerts when the metrics slip.